The Composers Of Doctor Who: Peter Howell | Warped Factor - Words in the Key of Geek. Christopher Morley takes a look at the work of Doctor Who composer Peter Howell. As our trawl through the music of the Fourth Doctor's era continues, we come now to the man who created the arrangement of the Doctor Who theme first heard during Season Eighteen. In line with new producer John Nathan-Turner's dictum that all future music for the series was to be made in-house using electronic instruments, Peter Howell used a bank of synthesisers including a Yamaha CS-80, ARP Odyssey & Roland Jupiter-4. "In 1979, production unit manager John Nathan-Turner was promoted to become producer of the show, taking over from Graham Williams. And he, quite simply, decided to fix everything. This extended from day-to-day production details like making leading man Tom Baker wear makeup, to a complete overhaul of the entire on-screen style of the programme. 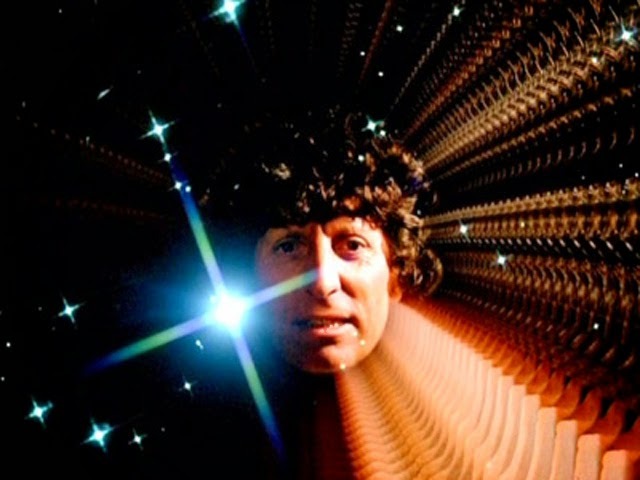 Bernard Lodge's innovative slit-scan graphics (introduced for Jon Pertwee's last season in 1974 and altered only slightly for Tom Baker in 1975) were replaced by a sequence based around a conventionally cell-animated star field. 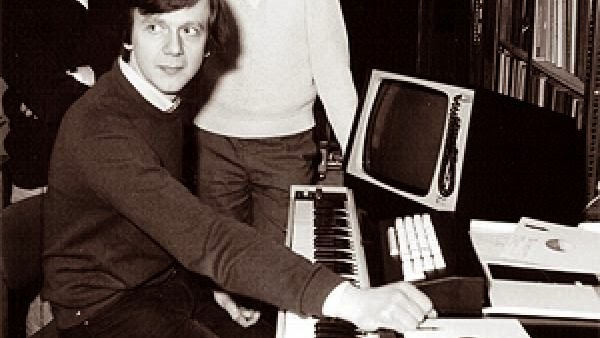 Regular incidental music composer Dudley Simpson was informed that he had written his last score for the programme, and the BBC Radiophonic Workshop were commissioned to take on compositional duties full-time. And the Workshop's Peter Howell was tasked with updating the theme music." "Peter decided to start from scratch, wanting to produce a version for the 1980's that was as technically challenging as Delia's had been for the '60's. Starting from Ron Grainer's original score, he used a variety of techniques. The bass line was created in a manner not totally removed from the original, with the sound, performed on Peter's beloved Yamaha CS80 synthesiser, assembled across two tracks of multitrack tape. This finished part was then run off onto quarter-inch tape, flipped over, and rerecorded through effects onto another reel to give each note a subtle pre-echo. The final effect was dubbed back to the multitrack. Other instruments employed included the ARP Odyssey (used for the opening line of the melody), the EMS Vocoder (used to build the complex texture voicing the answering phrase in the main melody), and the Roland Jupiter 4 (set to auto-arpeggiate in octaves, it provided the sound for the middle eight). The chordal parts were created by layering the Jupiter 4 with the CS80. The recording opens with an explosive whoosh - a kind of higher-tech equivalent of the "electronic scream" introduced in 1970 and, again, the origins of this sound have been the subject of much discussion. Informed wisdom suggests that the opening flameup was created from a basic sample of a match being struck, the original sound being trimmed to remove the initial scrape of match against paper, leaving just the flare. This was heavily processed and combined with a synthesised roar. Nevertheless, while the "match" effect was a standard part of a series of lectures Peter gave a few years ago, he does not remember using it at all on this recording, although it does sound as if he might have done! An alternative explanation is that the sound was entirely synthesised - this view supported by a demonstration Peter once gave on a schools' television programme, but in this case he was heavily simplifying the process, and may even have been playing a sample of the finished sound! In fact, Peter combined a processed recording of the downward glissando part of Delia Derbyshire's "electronic scream" with some white noise (and/or the match flare! ); the final effect was achieved by laying the combined sound to the multitrack tape machine running at 30 inches per second (the highest speed the machine would run at), then starting playback dead on the start of the sound. The doppler-like effect is the result of the machine's motors starting up then settling down to the correct speed, playing back all the time. The closing "explosion" was a result of a little bit of serendipity. The original multitrack reel was, in common with most reels of tape at the time, being reused, its previous use being for one of Dudley Simpson's Doctor Who scores. Peter discovered, purely by accident, that a particular minute burst of sound, played backwards at a particular speed through some effects units, produced this very pleasing "bang"! His handiwork was first heard at the opening of The Leisure Hive- while that was broadcast on August 30, 1980, he had in fact previously contributed additional incidental music to Carey Blyton's score for Revenge Of The Cybermen & handled ' special sound' duties on Planet Of Evil a year after joining the Radiophonic Workshop, having spent four years as a studio manager for the BBC. This wasn't his first dabbling in matters tuneful, though- starting out in the late Sixties 'psych-folk' scene, often working with collaborator John Ferdinando in bands including Ithaca & Agincourt. "The concoction of John Ferdinando and Peter Howell, two childhood friends from the hamlet of Ditchling, Sussex, England, Agincourt was in fact not actually a band but rather simply a name given to the trio of musicians who recorded it (Ferdinando and Howell were accompanied by the female vocalist Lee Menelaus). Ferdinando and Howell recorded several albums in Ditchling during the latter sixties and early seventies, during which time they appeared at times as members and guests of various regional acts such as Merlin's Spell and The Four Musketeers. 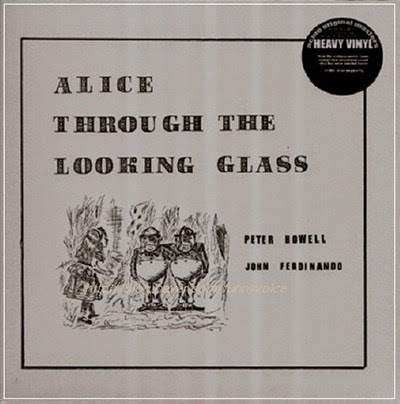 The two (sometimes with Menelaus) also recorded albums under the names Alice Through The Looking Glass, Ithaca, Friends and as simply Ferdinando & Howell. The partnership ended when Howell secured a position as a BBC engineer in the early seventies, working on among other things sound recordings for the television show Doctor Who. Ferdinando would eventually leave music for a professional career, but has over the years appeared been nominally active in his local music scene. Menelaus sporadically provided vocals for some small soundtrack and spoken-word recordings, but Agincourt never existed as a proper band beyond the recording of this album." Howell would record five further albums with Ferdinando before joining the Workshop- including scores for 1969's Tomorrow Come Someday & a musical adaptation of Alice Through The Looking-Glass. Some of these records have subsequently been reissued through Light In The Attic Records, with their work on Alice Through The Looking-Glass retrospectively acclaimed as a pastoral folk equivalent of Pink Floyd's Piper At The Gates Of Dawn. His Radiophonic output outside of the sound-worlds of Doctor Who also includes 1978's Through A Glass Darkly, including the track The Astronauts which would later be issued as the B-side to the 1980 single release of his theme tune arrangement for Who. This version would be used until 1986, when Dominic Glynn was asked to create an alternative for the Sixth Doctor's Trial Of A Time Lord story arc. The last time we'd hear the Howell original, albeit lower in pitch as there had been a technical issue in the process of editing the music, was as a prelude to Revelation Of The Daleks!